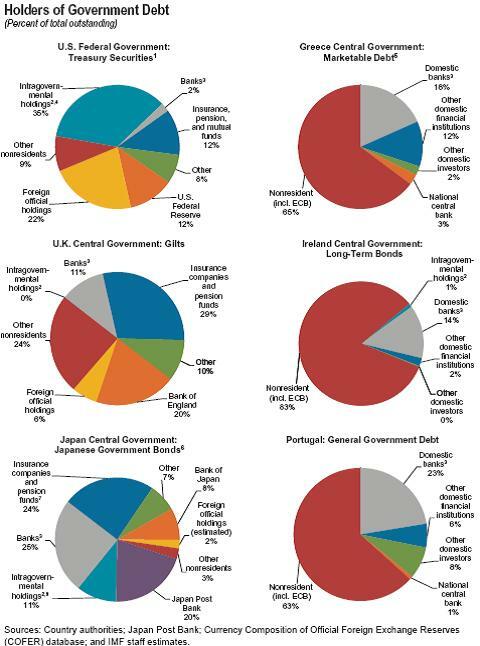 The debt owned by foreign investors and foreign central banks are in red and yellow; the other colors represent debt owned domestically. The “PIG” countries. Portugal, Ireland, and Greece owe most of their debt to foreigners.That’s a key reason their shaky finances are of international concern. Japan. It owes almost all of its debt to itself (i.e., its citizens and institutions). That’s a key reason the international community isn’t freaking out about its debt levels. The U.S. and U.K. The two “Uniteds” owe most of their debt to themselves (including their central banks, in orange), but also owe a substantial amount to foreigners. The yellow pie slice for foreign official holdings is, of course, notably large for the United States. Note: Such cross-country comparisons inevitably involve accounting choices. Note, for example, that the IMF includes amounts owed to the Social Security Trust Fund in the U.S. debt measure, but does not include state and local debts. 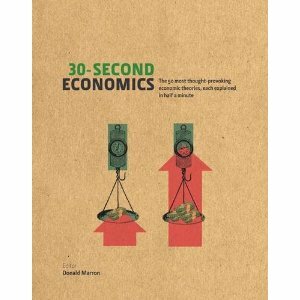 The first choice arguably understates America’s reliance on foreign borrowing, while the second arguably overstates it. This addresses the implications of debt ownership for cost of a default for the international community– what about probability of default? Do you think that countries whose debt is primarily owned by foreigners could be more likely to default because they bear less of the cost? To what extent might need to borrow from foreigners in the future counteract this? Thanks! Hi Liz – Good question. Reinhart and Rogoff conclude that external defaults are more common than domestic defaults, presumably because of greater willingness to impose losses on foreigners. However, the difference is not that great – domestic default is more common than one might expect. Hey , Awesome blog. I will post a link on my tumblr page.